MCCLAIN, Va. (April 01, 2008) -- Four Soldiers and two Department of the Army Civilians were recognized March 31 for excellence in Army journalism. 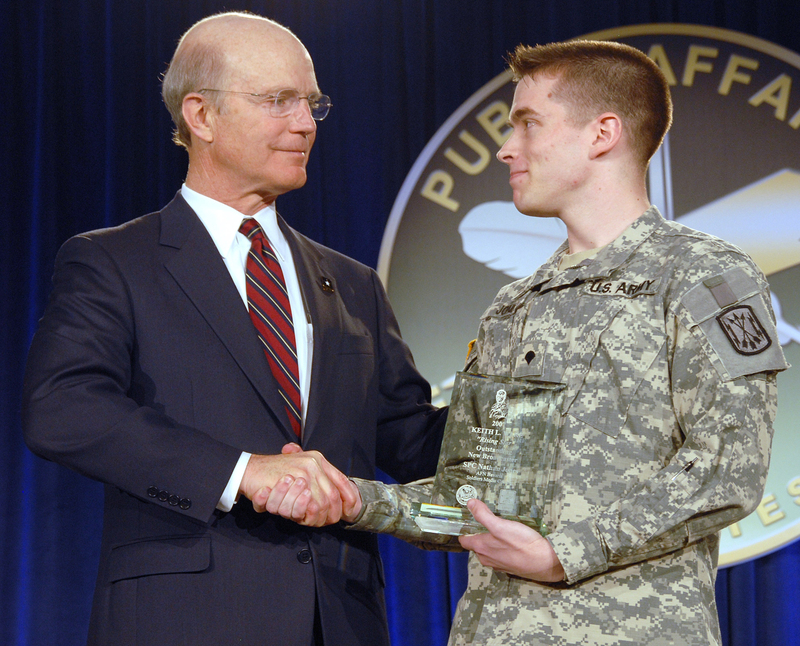 During the 2008 Worldwide Public Affairs Symposium, Secretary of the Army Pete Geren presented plaques to six of the winners of the 2007 Keith L. Ware awards. Secretary of the Army Pete Geren presented the "Rising Star" for Outstanding New Broadcaster award to Spc. Nathan Jones as part of the Keith L. Ware Awards ceremony held during the 2008 Worldwide Public Affairs Symposium in McLean, Va. Jones is assigned to American Forces Network-Bavaria as a broadcast journalist. His morning radio show there reaches an audience of about 80,000. Five other Army public affairs professionals were also honored during the ceremony. • The Paul D. Savanuck Military Print Journalist of the Year award: Staff Sgt. Mike Pryor, Fort Bragg, N.C.
• The Moss-Holland Civilian Print Journalist of the Year award: Mike Glasch, Fort Jackson, S.C. These six represent but a few of the many winners of the Army's 2007 Maj. Gen. Keith L. Ware Journalism Awards Competition. The competition recognizes military and civilian employee print and broadcast practitioners for journalistic excellence in furthering the objectives of the Department of the Army internal-information program. Award winners of the 2007 journalism awards will now move forward to compete against journalists from other services in the Department of Defense's Thomas Jefferson awards competition.